Instructor in the Rabb School of Continuing Studies, Division of Graduate Professional Studies. Ann Conway is a Design Strategist at Allstate Innovation, a business incubator, where she works to discover new, disruptive opportunities by identifying, designing, and developing concepts for businesses and services that create unique value for users. 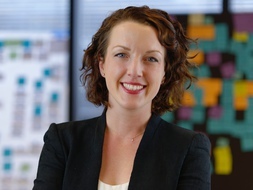 Ann has expertise in human centered design, service design, rapid prototyping, and facilitating the innovation process. She is currently leading a team developing smart services for homeowners based on predictive data modeling and artificial intelligence. In previous roles Ann led innovation and digital strategy initiatives at cultural institutions and startups in Chicago. She has an M.A. in Digital Media Design For Learning, and a B.A. in Children’s Media as Socialization from NYU.